SAN DIEGO ― San Diego Yacht Club (SDYC) hosted three days of races in the 2017 Etchells North American Championship involving 29 teams, Aug. 17-19. The eight races involved a fleet of 29, with three teams representing Australia and remaining teams representing the United States. Scott Kaufman with his crew (Jesse Kirkland, Alex Curtis and Austen Anderson) won the championship overall even after placing second in the final race. Alex Camet and his crew (Ben Mitchell and Patrick Powell) were initially in the lead after the first day of races. Kaufman and crew, aboard America Jane 1, took the lead the second day of the races. Kaufman plans to go to San Francisco in September to compete in the 2017 Etchells World Championship next. Keith Whittemore and crew (Peter Busch, Brian Thomas, and Kevin Downey) sailed to the top of the leader board with his Corinthian boat, Blonde Antelope. The Corinthian division does not involve professional sailors. Whittemore resides in Seattle but says San Diego has ideal sailing conditions, and he particularly likes SDYC events. Event chair and competitor Xavier Sheid appreciated all the sailors traveling far distances to participate in the Etchells North American Championship. 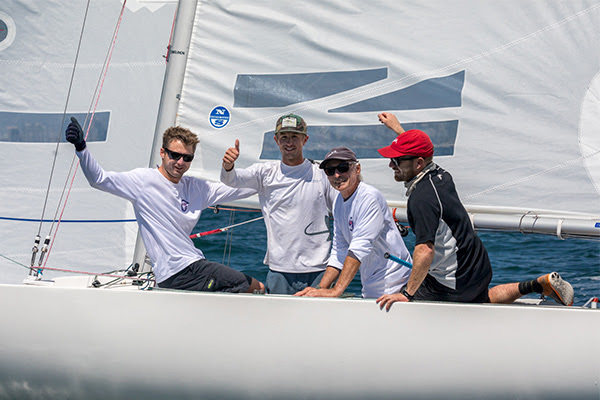 “SDYC and Etchells Fleet 13 are delighted to have had so many competitors from out of town join us for this regatta,” Sheid said. SDYC held a reception and awards ceremony for the sailors after the final races on Aug. 19. “SDYC showed off everything we have this week for the competitors. We designed the Malin Burnham Sailing Center with this exact regatta in mind – the Jessop Room for instance is large enough to measure an Etchells mainsail,” San Diego Yacht Club Commodore John Reiter boasted. “We served up champagne sailing conditions with 10-12 knots every day, just like in the brochure. “Congratulations to Scott Kaufman and crew on their hard earned win. Besting this field was no easy task and they should hold their heads high,” Reiter commended. Complete race results are available online at bit.ly/2x75wGR.